Please support independent journalism. Financially contribute to Citizens’ Media TV. LITTLE EGG HARBOR, NJ – Starting in the summer of 2017, the roof at Pinelands Regional High School was replaced. (Here is Citizens’ Media TV’s full coverage of the story.) The building, which opened in 1979, was topped with decaying asbestos containing material (ACM) in addition to other debris that had accumulated over the years. On May 11th, 2017, a contract was signed between the Pinelands Regional School District (PRSD) and Mike Kobithen Roofing and Insulation, Inc., of Philadelphia, Pennsylvania. The $54 million project became possible after a referendum, which initially failed in November, passed in January. The new roof was constructed via a process known as built-up roofing. Roughly speaking, built-up roofing is where the bare roof is painted over with a hot tar-like substance called asphalt, with a thin layer of stone glued on top of it. Holding these together is an industrial-strength adhesive called mastic. During the installation process, the asphalt and mastic produce toxic fumes. Soon after, however, the tar cools and the mastic congeals, and the danger is largely dissipated. Once settled, the materials in a modern built-up roof are safer to human health in the long term. Below the roofing material and debris, the bare roof on the high school is corrugated steel. 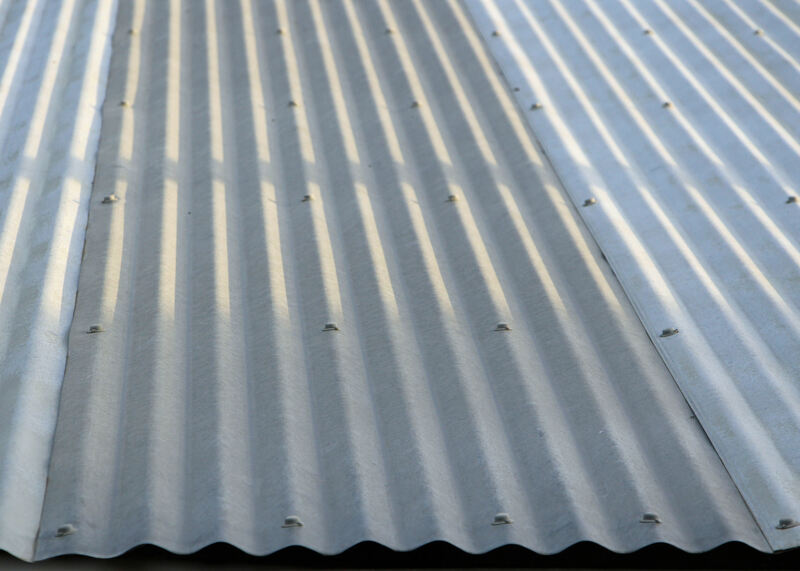 Corrugated steel is a thin sheet of metal, bent into long triangular grooves called flutes. 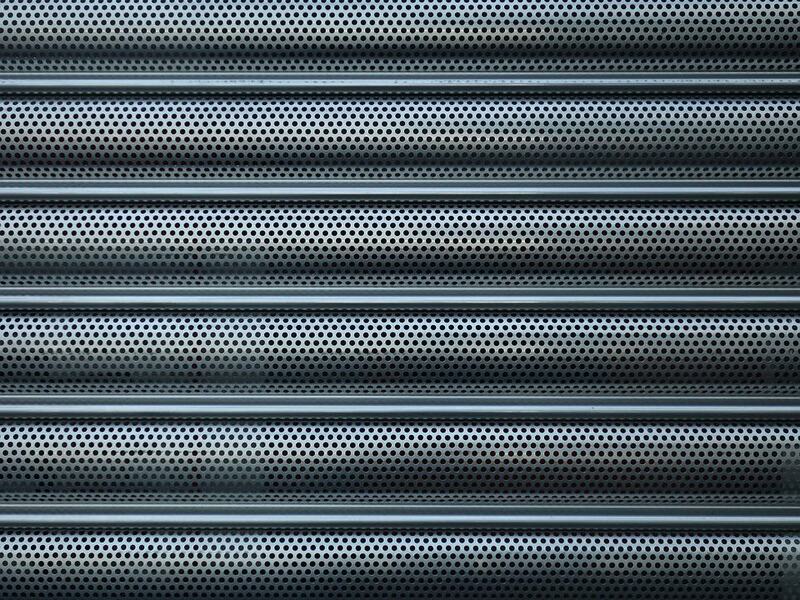 Some of these metal sheets contain an intentional series of holes (sometimes called “perforated decking“), some contain no holes. The sheets are fastened to the building with screws. Some of the screws have loosened, decayed, or broken over the years, leaving behind additional holes. It is through these holes, and the seams between the sheets, where dust and debris enters the school. Looking up in class 177, in the D wing. When in a room on the top floor of the high school building, if there are no ceiling tiles, you can see the corrugated metal. 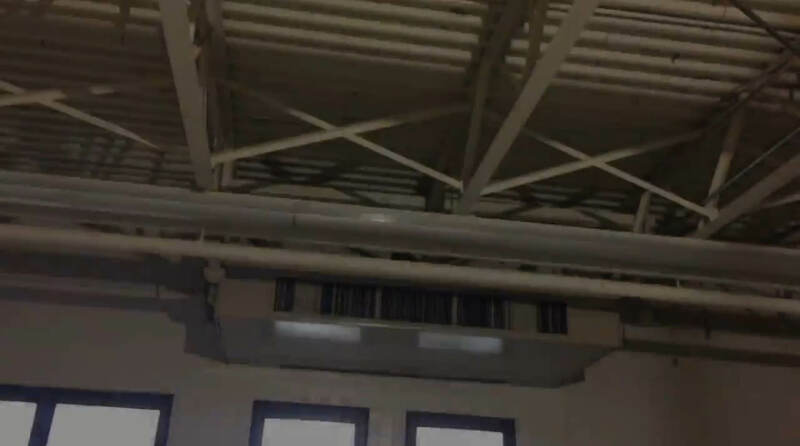 Most rooms in the high school have the large, rectangular, easily-moveable ceiling tiles. A few rooms, such as the music room which requires soundproofing, contain hard and unmovable tiles. The project began on June 19, and was contractually required to end on September 1st. Most of the work was indeed done by this time, but since much of the old roofing material was never cleaned off, it had to all be undone and then re-done. This caused the reapplication to occur during the school year. Against the urging of the district’s environmental consultant, and in direct contradiction with their contract, students remained in school during this time. The most controversial part of this story is how parents – along with the majority of elected Board of Education members – did not discover the letter in which this urgent recommendation was written (Epic Environmental’s letter dated September 10th), until after students were exposed to contaminants for three straight weeks. Many reported health complaints occurred during this time, including the expected symptoms of the toxic chemicals that are used in, and are a by-product of, built-up roofing: minor irritations such as burning chest, sore eyes and throat, coughing, and skin rashes. There were also reports of students drawing their names in dust, both on desks and inside lockers. The high school was finally closed in mid October, with all students crossing the street into the junior high school for “split sessions.“ For both junior and high school students, half of their instruction would occur during the day in the junior high school, and the rest at home on the internet. 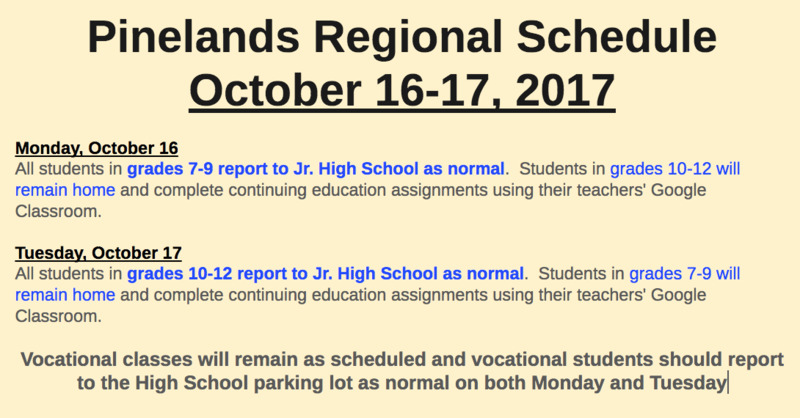 The return day for high school students was originally mid-November, quickly slipped to late December, and is now slated for January 17th.